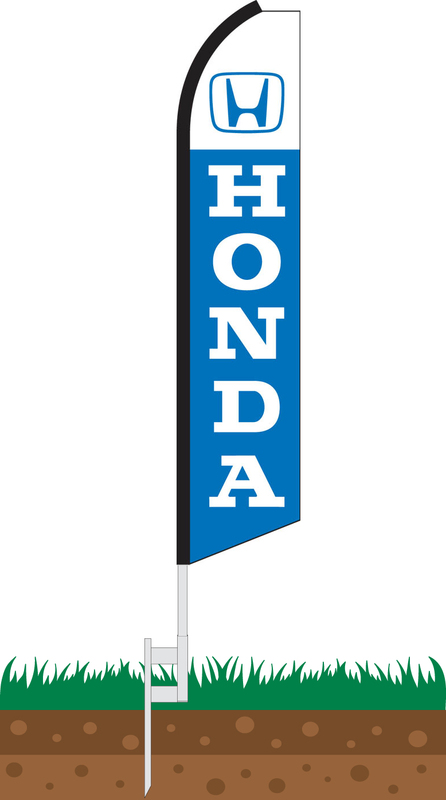 Our Honda Swooper Feather Flag consists of a white field at the top of the flag with the Honda emblem in light blue and the lower part of the flag is a light blue background with "Honda" written vertically in very large and bold white letters. 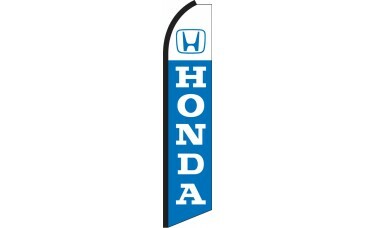 This Honda Swooper Feather Flag is an excellent choice for Honda Dealers looking to attract attention and promote sales. These flags can be used in front of the dealership, at trade shows, at sporting events, and much more. Our giant Swooper Feather Flags feature a free-flying end which allows the them to "flutter" in the wind with the slightest breeze. The flags measure 11.5 ft x 2.5 ft. and are constructed from durable knitted polyester fabric with double sewn hemmed edges and a hemmed sleeve. The extra strong black oxford sleeve is designed to hide dirt while withstanding the elements. A rope tie at the bottom finishes the flag and prevents it from becoming tangled around the pole. This type of feather flag is often referred to as a swooper flag, bow flag, super flag, or half sleeve flag. Our Deluxe 4-Piece Swooper Feather Flag Pole Setare constructed of 4 pieces of durable aluminum tubing that swedges together to form a 15ft. tall pole. 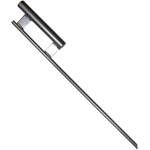 Our poles feature extra thick walls to prevent bending from harsh winds. The aluminum construction is sturdy and will never rust. Ground spikes are the right choice when you are looking to display your feather flag set in an earthy area such as in grass or dirt. These durable bases are constructed from plate steel and tubular steel with extra thick walls. They are welded together with strong "full line" welds as opposed to inferior "spot welds" done by competitors. Finally, they are finished off with a durable powder coating to give them a finished look and prevent corrosion from the elements. Tire Bases are the right choice if you are a car dealership looking to display your feather flag under the tire of a vehicle on your lot. 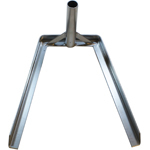 Our tire bases are constructed from extra heavy duty angle iron and tubing with extra thick walls. Then they are welded together with strong "full line" welds as opposed to inferior "spot welds" done by competitors. Finally, they are finished off with a durable powder coating to give them a finished look and prevent corrosion from the elements. Our X-Stand & Sand Bag Sets are the right choice if you are looking to display your feather flag on a solid flat surface such as indoors at a convention center for a trade show or outdoors on concrete or asphalt. These stands are constructed from two sections of formed pate steel that form a cross and steel tubing with extra thick walls. The 3 pieces assemble together with the included screw to form an x-stand. The kit includes a sand bag which is used as a weight to provide support. 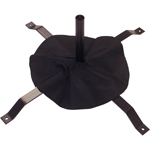 The x-stand is finished with a durable black powder coating to prevent corrosion from the elements. Please note: Sand is not included.